A new report from the University of Illinois shows that unions help combat income inequality in Illinois. Manzo and Bruno point out that the decline in unionization is a key reason why the state has experienced such high levels of income inequality, which can stifle economic growth. Their report suggests that increasing unionization would not only be a win for workers but also for economic growth in the state. Union membership for the state’s working-age residents dropped from 20.6 percent in 2002 to 17.2 percent in 2012, which increased Illinois’ income gap. That’s because median union employees, who make an average of $43,687 a year, earn $10,682 more than their nonunion counterparts. Overall, union workers on average earn 5.7 percent more in income than similar nonunion employees. Union workers in the bottom 10 percent earn an average of $14,685 a year, compared to the meager $3,701 for nonunion workers. As the report noted, unions play a key role in preventing workers from falling into poverty. The decline in union membership also puts more pressure on public resources because workers without the benefits that unions typically provide, such as health care and pensions, often depend on government programs. The authors offered recommendations to address the decline in unionization in Illinois. The state should continue to promote workers who want to form a union. Also, employers should be forced to put up a notice detailing workers’ rights, even for those who are not in a union. Specifically, these notices should discuss lawful, collective actions employees can take in an effort to improve their pay and workplace conditions. The state avoid right-to-work policies, which weaken the labor force and drag down wages. While union membership in Illinois has declined, the percentage of workers in lower-quality, part-time jobs has seen an uptick. In 1995, the share of Illinois workers who worked part-time was 15.5 percent. But that figure spiked to 19.2 percent, or nearly one-fifth of the workforce, in 2012. “Given that we’ve shifted so much of employment to part-time, informal or conditional work, raising the state’s minimum wage would be of great help to lower- and middle-class workers,” Bruno said. In addition to raising Illinois’ $8.25 minimum wage, the report called for the expansion of the state’s earned income tax credit, a more progressive income tax, crackdown on wage theft and increase investments in childhood education and public infrastructure. UFCW Local 1546 members rally for immigration reform in downtown Chicago. President Barack Obama yesterday told the Spanish-language Los Angeles affiliate of Univision that “the day after” the budget and debt ceiling debacle is resolved, he will push for passage of comprehensive immigration reform. His comments came a week after thousands of immigrants and union, community and faith activists marched and rallied on Capitol Hill in Washington, D.C., delivering the message: “The time is now” for a vote on comprehensive immigration reform with a road map to citizenship. Enter your zip code and you will be connected with your congress person. Tell them to allow a vote on immigration reform that includes a path to citizenship. Dominick’s Stores to be Sold by Safeway Inc.
Our union was informed at 3pm today by parent company Safeway Inc. that they would be selling all Dominick’s stores. Safeway Inc. operates 72 Dominick’s stores in the Chicago area and is speaking with multiple potential buyers. As new developments arise we will keep you informed. A salmonella outbreak in chicken that has sickened people more than 270 people in 18 states is the latest incident that has been impacted by the government shutdown caused by republicans in Congress. Workers at the federal Centers for Disease Control and Prevention have been on furlough since the shutdown began. Prior to the shutdown the CDC had just a few scientists working on outbreak detection resulting in a backlog of investigations. The CDC is now recalling some of its furloughed workers to deal with the outbreak but it will take time to catch up on the backlog. Meanwhile, people are continuing to get sick. “This outbreak is another example that American lives are being put at risk while republican in Washington, D.C. hold the country hostage,” said Ken Boyd, president of UFCW Local 1546. “It’s time for America to get back to work. The Food and Drug Administration has stopped routine inspections of food facilities in the United States. Federal occupational safety and health inspectors also have stopped most workplace checks. The government shutdown has also forced the federal Mine Safety and Health Administration to stop its regular mine safety inspections, which normally occur every three months. Three mine workers died in separate accidents on three consecutive days during the past week. As the government shutdown drags on, many pundits have drawn attention to how gerrymandering has helped give the American people a handful of right-wing Republicans willing to shut down the government as part of their ideological crusade against Obamacare. What has not been widely understood is how Walmart, the nation’s largest retailer, is also a top funder of an effort to turn state legislatures red and control the redistricting process. Perhaps Republican operative and former Bush advisor Karl Rove put it best when he wrote, “He who controls redistricting can control Congress” in a 2010 Wall Street Journaleditorial. And with the millions Walmart gives to the Republican State Leadership Committee, the Republicans Party’s top influencer of redistricting, Walmart and the Waltons have played a disturbingly significant role. The result: primaries pose a bigger risk to most Republicans than the general election, and Republicans are engaging in a race to the extreme right. This theory is borne out by Think Progress’ tally of House Republicans who are willing to resolve the crisis and back a continuing resolution like the one passed by the house. As of last Tuesday, there were only 14 such House Republicans, and in their districts Obama averaged 48.8% of the vote in 2012. This is where Walmart comes in. The 2010 Republican takeover of state legislatures was led by the Republican State Leadership Committee (RSLC), a so-called dark money group that can take in unlimited corporate contributions and obscures that money’s origins as it is redistributed to influence state races. A Pro Publica report explains that when it was formed in 2002, the RSLC “was primarily a vehicle for donors like health care and tobacco companies to influence state legislatures, key battlegrounds for regulations that affect corporate America.” But in 2010, the group got a new chairman and a new focus: to influence redistricting. The RSLC may have thousands of donors, but Walmart is consistently among the top 20. Since the 2004 election cycle, Walmart has given the Republican State Leadership Committee over $1.5 million, according to data compiled by Open Secrets. In the ongoing election cycle, Walmart is currently the group’s top donor. All of this is in keeping with Walmart and the Walton family’s (which controls Walmart) long history of backing Republicans and right wing-causes, especially at the state level. Since the 2004 cycle, Walmart has spent over $12.7 million in state-level races (not counting its contributions to the RSLC), according to Follow the Money. Nearly 80% of that money went to Republican candidates and party committees. The Waltons, meanwhile, give almost exclusively to Republicans, and in 2010 they helped finance the Republican takeover in a big way. Despite not being from there, six Waltons were among the top fifteen political donors in Wisconsin legislative races during that election cycle. In fact, Alice Walton was the top individual donor to Wisconsin legislators during the 2010 cycle. The 2010 GOP strategy worked. Walmart joined forces with the US Chamber of Commerce (which Walmart also funds), tobacco companies, pharmaceutical companies, and others to fund the RSLC and help Republicans win 675 legislative seats and gain control of 12 more legislatures, including places like North Carolina, where it had been over a century since the GOP last controlled the state. Ultimately, Pro Publica explains, “the GOP oversaw redrawing of lines for four times as many congressional districts as Democrats.” So even after Democratic candidates for Congress won 1.1 million more votes than Republicans, the GOP was able to maintain its control of the House. For $1.5 million over the past decade, Walmart was able to help the Republican State Leadership Committee secure control over the Congressional redistricting process. This in turn gave the Republicans 54% of House seats despite winning only 45% of the popular vote and ample opportunity to grind the government to a halt, even without the support of most Americans. Chicago was among the 183 nationwide rallies pushing for comprehensive immigration reform on Saturday. Those events were part of a national push in 40 states to prepare for a massive rally planned for Tuesday on the national mall in Washington DC. In Chicago’s Union Park, Governor Quinn, Mayor Emanuel, and Comptroller Topinka joined over 300 faith, labor, and community leaders to call on Republican Leader Peter Roskam for a vote in the House on citizenship, keeping families together and an end to deportations. After the rally, over 400 leaders passed out more than 3,000 flyers and door-hangers to voters in Wheaton, IL, Roskam’s home town, to urge him to lead on the path to citizenship. One group talked to Roskam’s newly naturalized Irish immigrant neighbor who enthusiastically supports the path to citizenship! In Central IL, led by Illinois People’s Action, 20 leaders braved torrential rain and record heat marching over 50 miles to demand Congressman Rodney Davis support the path to citizenship. Over the coming weeks, organizations will be putting direct pressure on Deputy Whip Roskam, Speaker Boehner, Majority Leader Cantor, Majority Whip McCarthy, and the 26 House Republicans who have come out publicly against comprehensive immigration reform. Join us on Oct 12 for the Mega-March for Dignity and Respect in Chicago as we keep this momentum and pressure on Reps. Roskam, Davis and Congress to pass a path to citizenship. Over the last year, Walmart workers and members of the Organization United for Respect at Walmart (OUR Walmart) have called on the retail giant to stop its practice of retaliating against workers who are simply exercising their right to speak out for a better life and improved working conditions. Their calls for change have been met with Walmart’s extreme response of firing and disciplining workers who speak out for positive changes in the workplace—leading many to seriously question the company’s relationship with workers throughout its supply chain. Leading up to the holidays, members of OUR Walmart and community supporters will continue to call on the company to publicly commit to raising wages and increasing access to full-time hours so that no worker at Walmart makes less than $25,000 per year. Members of OUR Walmart are also calling for the rescission of all illegal firings and/or disciplinary actions against more than 70 workers who participated in a legally protected unfair labor practice strike in Bentonville, Arkansas, earlier this summer. Friday, November 29—also known as Black Friday—is the most important day of the year for retailers like Walmart, and OUR Walmart members have announced widespread protests leading up to and on Black Friday this year. As Black Friday approaches, please commit to supporting OUR Walmart members as they take action this holiday shopping season by signing the petition pledging to join Walmart workers this year in their calls for change at http://action.changewalmart.org/page/s/black-friday-pledge. House Democrats introduced their immigration reform bill H.R. 15 on Wednesday which is nearly identical to the one passed in June by the Senate in a 68-32 bipartisan vote.The House bill replaces the border security language from the Senate version with a measure that passed in the House Homeland Security Committee that includes more specific metrics to be met to ensure border security. Like the Senate bill, the House measure overhauls the legal immigration system, increases border and interior security enforcement requirements and provides a path to citizenship for some of the estimated 11.7 million undocumented immigrants currently in the United States. The bill currently has 120 co-sponsors all Democrats, including Reps. Robin Kelly (IL-2), Mike Quigley (IL-5), Tammy Duckworth (IL-8), Jan Schakowsky (IL-9), Bradley Schneider (IL-10) and Bill Foster (IL-11). The Illinois Coalition for Immigrant and Refugee Rights (ICIRR) has praised the effort to push for common sense immigration reform. ICIRR is urging voters to contact House Republicans, including Chief Deputy Whip Peter Roskam from Illinois, to allow a vote on immigration reform legislation that includes a path to citizenship. In the next few weeks you will be receiving a letter from your employer informing you of the opening of the health insurance marketplaces (formerly called “exchanges”) established under the Affordable Care Act (ACA). Employers are required by law to send this letter to all employees – even if they provide health insurance coverage. This letter may be confusing, but the following information should help answer some common questions. • If you have employer-provided health coverage, this letter is strictly informational and does not mean that you are being dropped from coverage. You are not required to use the marketplace to find health insurance. • If you do not receive health coverage from your employer, the marketplace will be a central location where you can compare and shop for health care plans. Visit healthcare.gov to find the marketplace and the options available to you. • The letter you receive may resemble one of two types of notices. One notice is for employers who offer health coverage to some or all employees, and one is for employers who do not offer health coverage. Again, your current health care coverage is not changing. If you have any questions please contact your union representative. Tell Congress: Don’t Shut Down Our Country! As of midnight, October 1, the Republican led U.S. House of Representatives has shut down the federal government, despite the fact that America’s working families overwhelmingly disapprove of their tactics. In a CBS/New York Times poll last week, 80% of respondents said that it would be unacceptable for lawmakers to threaten a shutdown to achieve their goals, yet that’s exactly what Republicans are doing. If the shutdown lasts more than 10 days, more than 2 million military service members could see their pay delayed. Nearly 9 million pregnant women, recent mothers, and young children could lose clinical services and food benefits. Educational, compensation, and pension benefits for hundreds of thousands of veterans could be delayed. Applications for new Social Security benefits would be delayed and services for seniors significantly delayedas workers are furloughed. 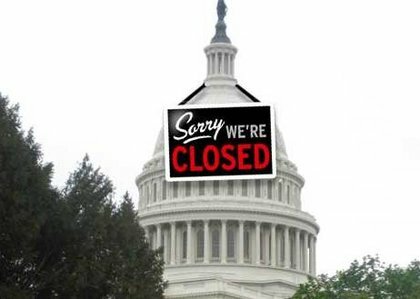 If the government is shut down for the same length of time as it was in the mid-1990s, the cost for taxpayers would be about $2 billion.